Life on the road has a habit of changing moods in an instant. Goods moods go bad and bad moods go good. The last week has really exposed the fickle nature of human moods and how quickly they can change. A simple sign over the road gives hope to my ride. I feel elated. The answer to a question long delayed breaks my heart. I feel agony. Copper Canyon had a profound effect on my psyche. It is only now I am understanding its aftermath. Riding through the Canyon was impossibly difficult. It was a challenge that destroyed former limits forcing confidence to new levels. It made me feel alive. Then, when my tires found pavement and lung-bursting climbs turned gradual, I experienced a feeling of loss. Almost like PTSD. Suddenly my mind was no longer engaged in the task at hand. It wondered away questioning my motivations and it formed new plans. 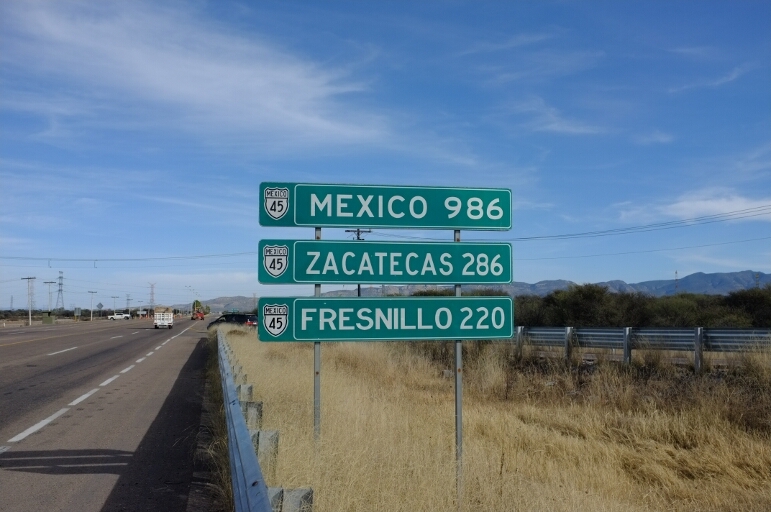 I also realized how close to the border I was. Maybe I should turn north and ride home. I can always resume the ride at some future date. But it’s winter. I can ride till it gets too cold then hitch-hike the rest of the way. I can take a bus. Suddenly, my challenge was no longer physical but a mental struggle to maintain focus. Everything changed when I saw the sign. 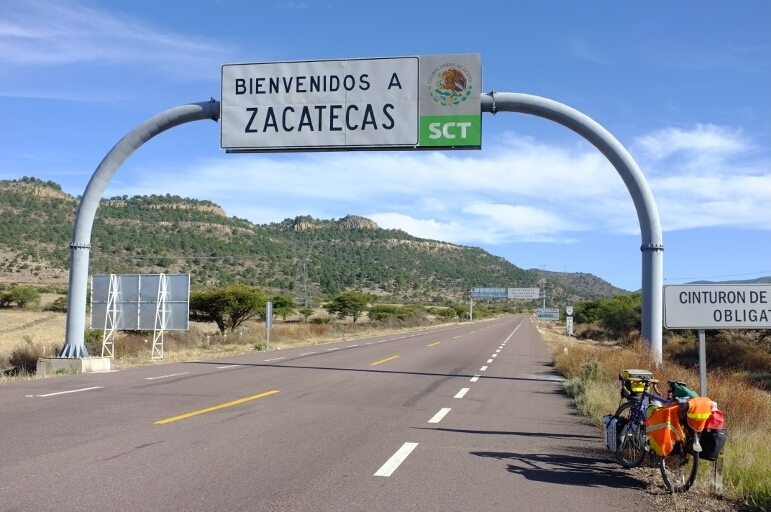 Arching over the road in white block letters it read, “Bienvenidos a ZACATECAS.” Another Mexican state crossed, yes. But more importantly, it demarks forward progress. Forward progress!!! I am now, finally, further south than I was before I began that rediculous six week detour. My goal is closer than it was before!!! Unfortunately, good moods do go bad. The emotions that arose are difficult.The obvious pain and anguish mixed with relief further compounding the intensity. The physical manifestations of these emotions were even more suprising. The sickness in my stomach. The tremble in my hands. My legs too weak to support my weight, my bike bore the burden as I walked away from the hotel into the void the world suddenly became. It was an odd feeling. Like walking through a tunnel at dusk. I could barely see and didn’t entirely know where I was. Fortunately, sour moods turn sweet just as easily as savory moments turn bitter. 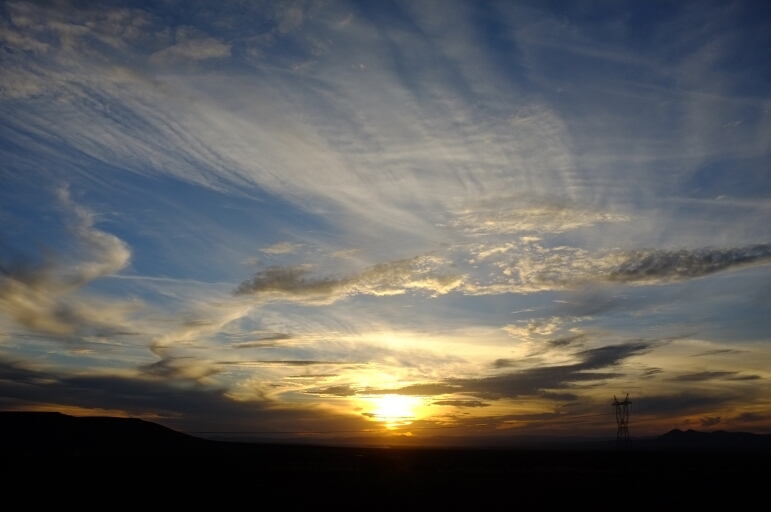 The walk to the hostel provided ample time to reflect and process the most difficult feelings. I feel only love and happiness for her. I also feel relief. This knowledge frees my soul to dream a secret dream I’ve long been afraid of. The more I travel the more I want to travel. Extended travel and love do not travel well unless your love is by your side. I no longer fear the dream of future travels. I no longer fear the dream of finding the love that travels by my side. The atmosphere of hostel life conversed to sweetness most of my remaining sour moods. I spent the evening in quite conversation with like minded individuals from around the world. I was invited to dinner. 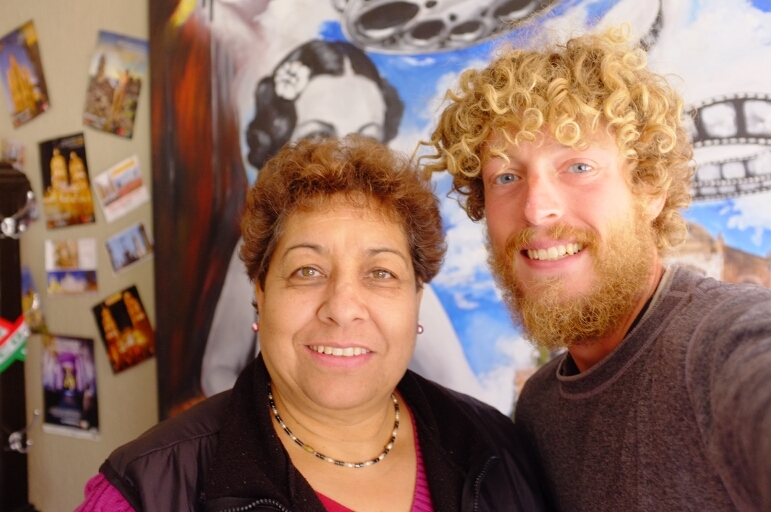 I met an older German couple who, in riding a motor bike here from Alaska on the way to Argentina, validate my dream of love at my side (or, in their case riding a motorcycle, love directly behind). And while remaining emotions require more time to comprehend, I am ok. I am more than ok. I am on an epic quest to find future for my life. I ride to understand myself. And I ride in pursuit of a goal I began long ago when I decided fear would no longer control my life. It’s funny I find these words now. I have learned so much from her and now, in what may be the final lesson, she teaches me the most important: the reason I am here. 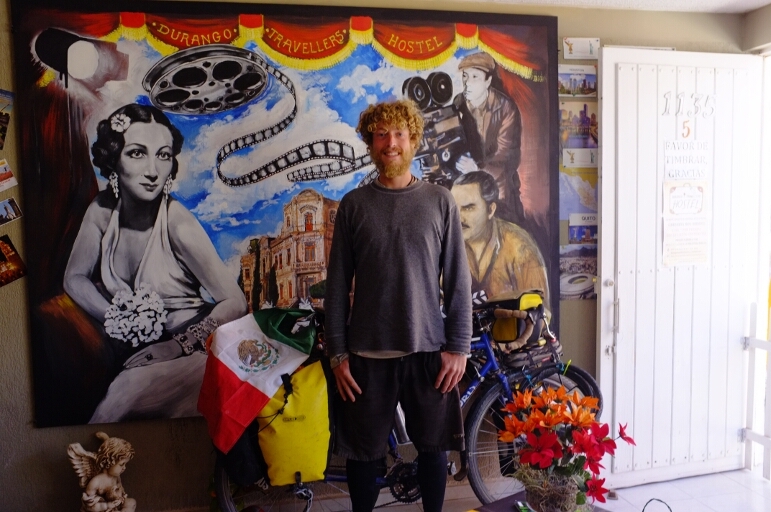 Leaving the hostel in Durango was easier than I feared. Doning my costume after a nice warm shower I was very excited to be back on the road. I met AAAA and his daughter. I was searching for a tienda to satisfy a craving: cereal and milk. 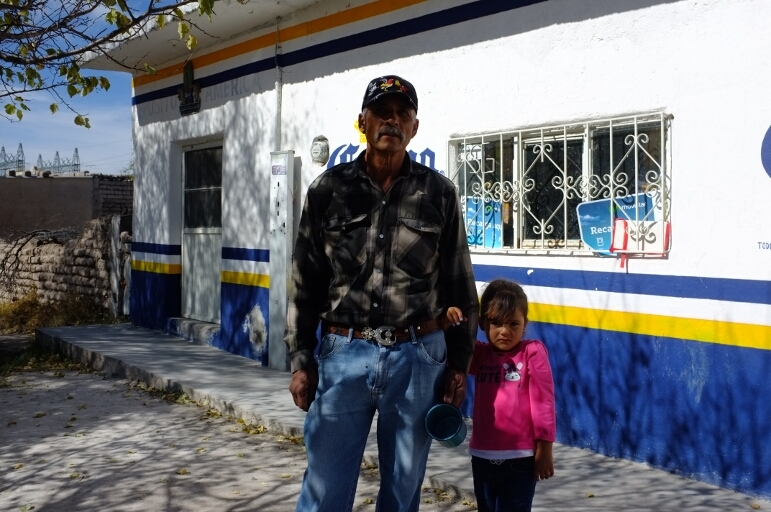 They only sell beer at this store, but in another random act of kindness he told me to wait a moment then went inside his house. He returned with a plate full of tomales and the giant cup in his hand filled with coffee. After I finished the tomales, he brought me half of a squash called a kalavasa or something like that. 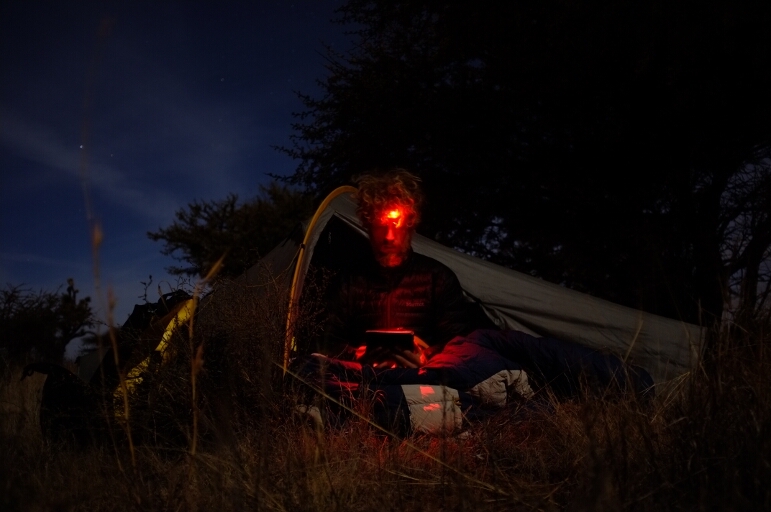 Epic campsites enhanced by the full moon, the sixth of my journey. Reading in my porch basking in the light of the full moon. Fool me once, shame on you. Fool me twice, shame on me. 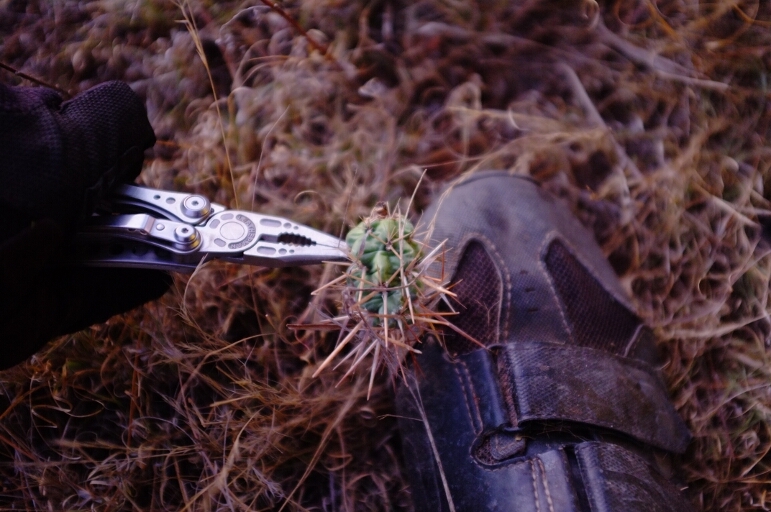 After my experience with cactus in Baja, when I found this one stuck to my shoe I went straight for the pliers. 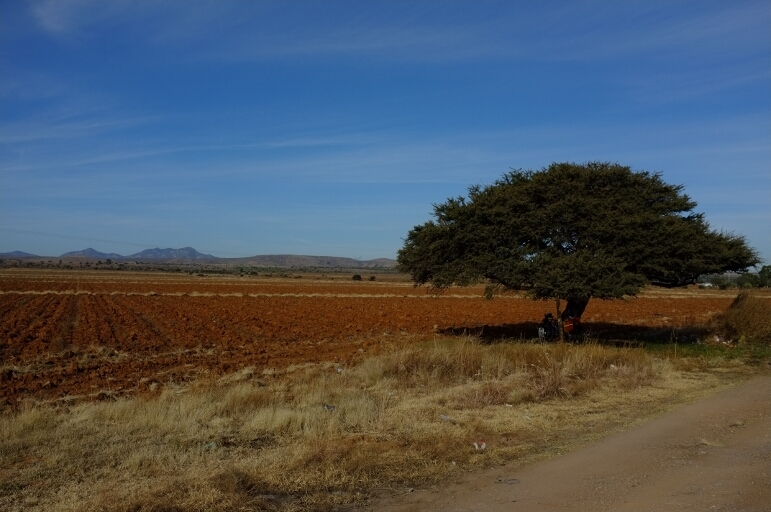 Lots of farming in this land and gorgeous dirt in all shades of red. 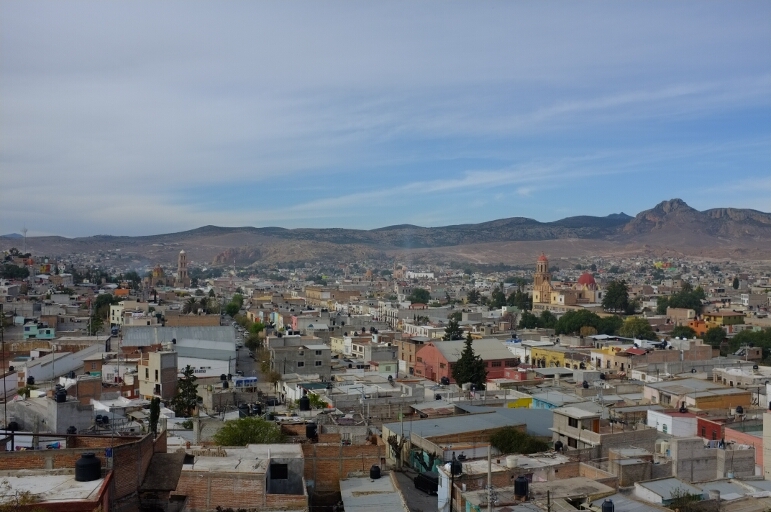 Giant cathedrals are the hallmark of cities here in Mexico. They are stunning both inside and out. In this Puebla there are five massive Cathedrals. Four are visible in this picture. I am reading a book of the history of Mexico. 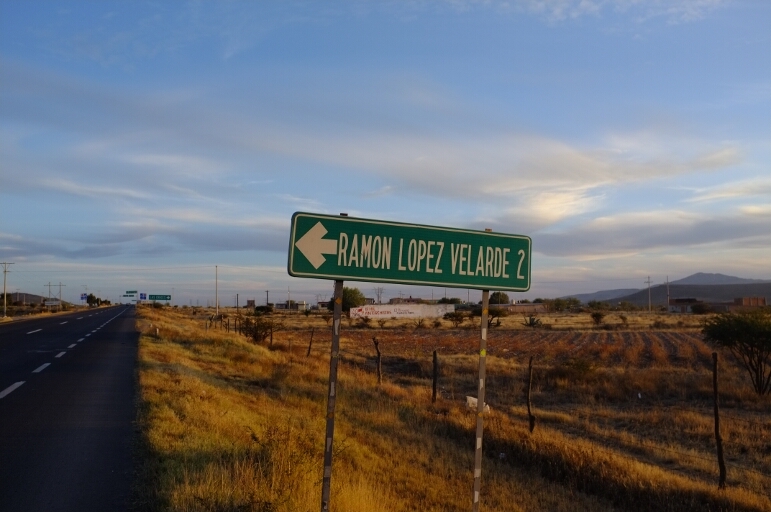 Now, when I see names on signs they have meaning. Awesome feeling. 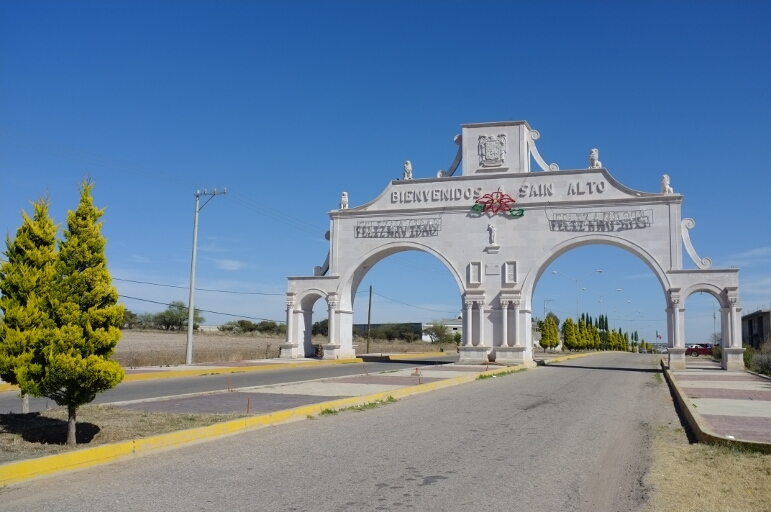 I have come to love the arches that adorn the entrances to Mexican cities. I did not enter this Puebla. I only observed its arch. I really enjoyed this hotel. I especially enjoyed the paper strip on the toillet saying, “Sterilized for your protection.” It stands in stark contrast to every other hotel I’ve stayed in. Many do not even have toilet seats. That key is as big as my hand.